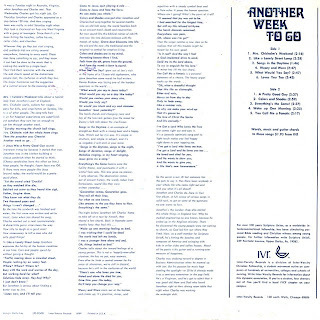 Another Week To Go (Inter-Varsity LPS-02498) 1967? Not only is this independent production one of the earliest Jesus music lps, it’s also one of the very few with consistently strong song-writing, arrangements and production from start to ﬁnish. Jonathan hails from London, Charles from Virginia, but together the sound is solidly UK, mastering the ‘60s folk/pop style of other duos like Peter & Gordon and Chad & Jeremy. Strong organ presence throughout, enchanting acoustic guitars, ﬂoating ﬂutes, phased electric guitar, conﬁdent drum beats – it definitely has that fragile dreamy dated psych-edged sound that makes collectors like me ﬂock to it. All original material, ranging from the delicate ethereal ‘Like A Lonely Street Lamp’ to the melodic optimism of ‘Songs In The Daytime’ to the artful ‘Mrs. Chisolm’s Weekend’ to the jangly upbeat ‘Loves You Too’ to the soft melancholy tug of ‘You Call Me A Fanatic’. Love those psychy electric guitar ﬂourishes on ‘Jesus Was A Pretty Good Guy’. Every song has a freshness and vitality rarely heard in the early Christian music scene. Certainly oughta put a smile on those longing for that British invasion sound. Two different versions exist: one has ‘Colors & Shades’ as the second song on side two, the other ‘Why’ to the tune of ‘Blowin’ In The Wind’. Collectors will want to seek out both pressings. Later released on the Herald label in Britain. (The Archivist, 4th edition by Ken Scott). 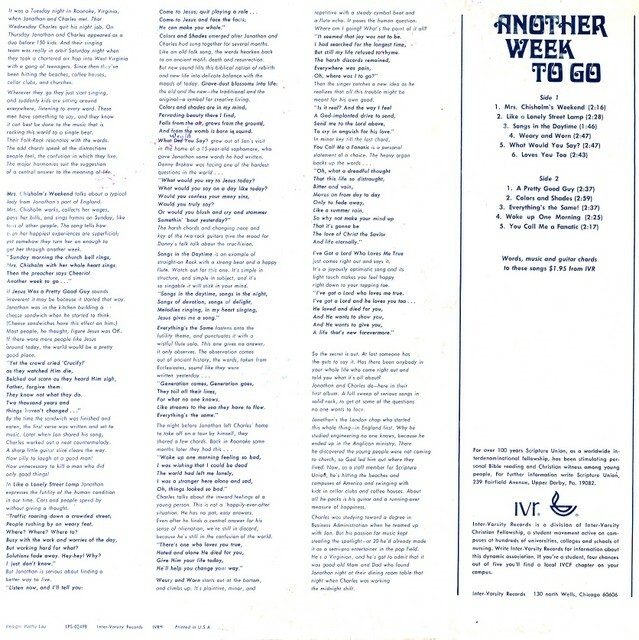 Original rear cover with the “Why” song. There are two versions of this album, one has the 8th song as ‘Why’ and the other ‘Colors and Shades’. Additional information and review can be found below. http://rateyourmusic.com/release/album/jonathan_and_charles/another_week_to_go.p/ in the comments of RDTEN1 Jun 19 2009. Thank you George for both the front and rear cover photos. Thank you Donald for the Hearld Label front and rear photos. i found this on cd last year and bought it, because i loved the cover and album's description on the back. highly recommended! hi…great blog…but now that you just refer us to the archivist (too poor to buy it, believe it or not) I don't have much to go on…any chance of even a 1 sentence review? The two versions of the album exist because they ran into copyright problems for using the tune to “Blowin’ in the Wind.” So the album with “Why” is the first release; “Colors and Shades” was substituted to settle the copyright complaint.